This sweeping epic of excess follows philandering paparazzo Marcello Rubini (Mastroianni) through a series of bizarre, tragic, and hilarious encounters in nocturnal Rome. Sunday, December 23 at 7:00 pm and Tuesday, December 25 at 3:30 and 7:00 pm. 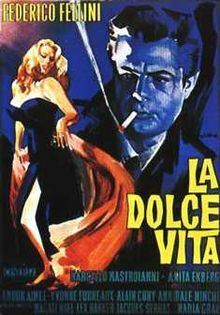 (1960, 35mm, 174m, Italian w/ English subtitles) dir Federico Fellini w/Marcello Mastroianni, Anita Ekberg, Anouk Aimée. Members of The Italian Cultural Center receive a free popcorn with the purchase of a full price ticket. Find out more here.